How often have you heard, “We know what works, but we don’t know how to scale it up?” Translation: WRAP Group evidence into daily practice is a common struggle across human service systems. 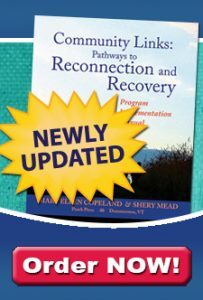 If you’ve faced this challenge or if you’ve wondered why public systems struggle to offer recovery programs more broadly, this online course is for you. The faculty discusses common barriers to introducing evidence-based practices with fidelity, as well as how to sustain them as part of mental health systems change. Learners are introduced to the stages of program implementation, important policy issues, and scale-up strategies that have been used successfully in public health and mental health. Two entire classes focus on WRAP as an example of how knowledge generated through science can be introduced on a wide scale in real-world settings. Register today to spark your thinking and learn proven strategies for implementing evidence-based programs, including WRAP, on a larger-scale. This course is eligible for Continuing Education credit for those who want it. At a cost of $5.00, it is the best bargain around, and this fee can be waived by following the instructions. You can read more and access it at: http://www.cmhsrp.uic.edu/health/ebp-wrap-course.asp. see how large scale implementation of EBPs works on state and national levels. All instruction and instructional materials are web based. Each of the 8 modules includes a 30-minute lecture (Windows Media), downloadable Powerpoint Presentations (Adobe PDF), homework assignments (included in the slide presentation), and required readings from a list of selected readings (Adobe PDF). Text transcripts are posted for all audio lectures.